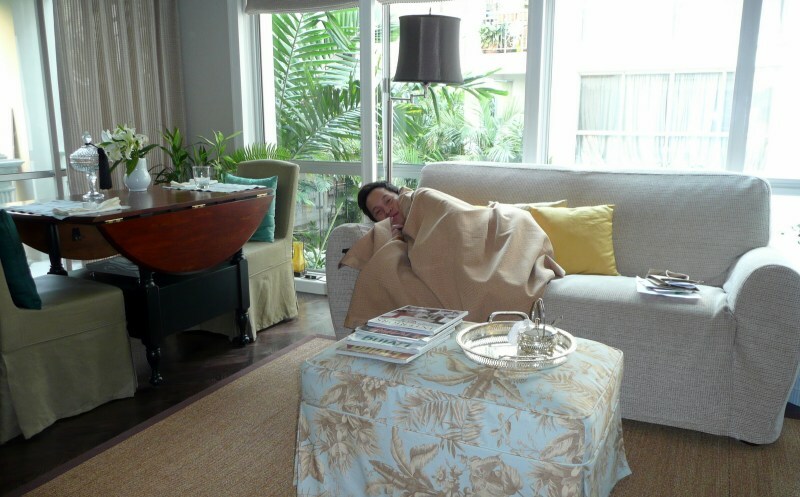 Above: Chilly and breezy morning here in Khrungthep, as Tawn huddles under a blanket on the sofa. Some of you have heard this story, but many of you haven’t. In December 1999, in a friend’s loft in Tribeca, I made the decision to quit my job. Having accepted the position of Senior Manager at the still under construction AMC Empire 25 theatres near Times Square, I had traveled to New York from San Francisco to meet my team and to look for an apartment in advance of my move in January. After an afternoon of meeting with the people who would be working under me on the adventure of opening the largest, most complex theatre AMC had ever opened, I realized that I was being set up for failure. The team was rife with inexperience, several people having never working in the theatre exhibition industry at all. That evening, in Michael’s Tribeca loft, I considered my options. A few weeks prior I had interviewed with another company, IKON Office Solutions, just to be aware of what was out there. The interview had unexpectedly resulted in a job offer, tendered by a former AMC colleague who was now a recruiter for IKON. I called this recruiter friend and confirmed that the offer was still on the table. Within minutes, he faxed over an offer letter which I signed and returned. I then drafted my resignation letter and called my boss in California. Not surprisingly, he spent most of the call talking about himself. No attempt was made to empathize with me or to understand my concerns. After almost thirteen years with the company, on the brink of opening the most prestigious theatre in the chain, he didn’t seem concerned that I was leaving. Having worked nearly every holiday since 1987, as one does in the exhibition business, I chose December 30th as my final day. I was not going to work New Year’s Eve again. My roommates Colleen and Nina had spent several months the previous year backpacking through Southeast Asia and they had enjoyed it very much. Intrigued, I decided the best way to spend my two weeks between jobs was to go explore the north of Thailand. On December 31st, using family passes from my employee father, I boarded United Airlines’ San Francisco to Hong Kong flight, on my way to Thailand. This being the last day of 1999 – remember the Y2K scare that computer systems worldwide would shut down because they hadn’t been programmed to recognize the new century – the flight was nearly empty. The 747, with more than 300 seats, had only 35 passengers in the entire plane. The number of crew members almost matched the number of passengers as we sat in the gate area. Boarding took all of five minutes and we pushed back a half-hour early. The flight was an interesting one. Each flight attendant stopped by my seat to chat with me for a while, apparently lacking anything better to do. When we crossed the International Date Line, the flight attendants went running down the aisles wishing everyone a Happy New Year and pouring champagne. But of course at that point, it was already seven in the morning local time. Because of the cruel nature of westbound transpacific travel, I never did get my “end of the century” New Year’s Eve. The crew asked me to take a picture of them, posed in the cabin, a picture that the purser mailed me several weeks later. After spending a few days in Hong Kong visiting friends from when I lived there in 1998-1999, I set out to continue my journey to Bangkok on the evening of January 3rd. Standing in the employee check-in queue at Chek Lap Kok airport, there was this cute, skinny guy with a long face and beautiful eyes standing in front of me. He turned around and we made eye contact. He smiled. I smiled back. He was checking in with a group of other guys, who I assumed were his friends. Later, I found out they were the boyfriends of his colleagues. Looking at the round orange tag on his luggage, I could tell from the code (BKKFS) that he was a Bangkok-based flight attendant. After checking in, he and his friends disappeared. As I went to the gate and stopped for some dinner, I ran into my roommate Nina’s friend Perry and her mother, who were on their way to India! We spent an hour or so visiting before I continued to the gate. At the gate I saw the cute guy and his friends again. The load for the flight was very light and when I boarded and took my seat in the downstairs part of business class, I observed that one of his friends asked the flight attendant if he could move to the upper deck. Figuring that they would all end up sitting upstairs, I asked if I, too, could change seats. The flight attendant said yes, so I went upstairs and selected a seat at the back of the cabin, calculating that it would be easier to see him because he’d be sitting in front of me. Sure enough, the cute guy came upstairs and sat in the emergency exit row, three rows ahead of me and on the other side of the aisle. Every so often he would turn around and look back at me. The on-duty flight attendants stopped by to say hi to him and he went back to the galley once or twice during the flight. Throughout the two-hour flight I noticed that there were a lot of flight attendants who came upstairs. Of the fourteen flight attendants scheduled on the flight, it seems like all of them came up to offer me refills on my orange juice and nearly all of them tried to use my name. “More orange juice, Mister… um… Schultz?” Something was up. Finally, shortly before descent, I worked up enough courage to say something. I was at a major turning point in my life, leaving a long-held job for a new one, leaving one century for the next, traveling across the world before returning home. Why let this opportunity pass me by? I know, not the most suave and sophisticated of lines, but it was enough to jump start the conversation. As it continued, I confirmed that he did indeed work for United, his name was Tawn, and he wasn’t that interested in kickboxing. “Where are you staying?” he asked. “The Crowne Plaza on Thanon Silom,” I replied. “Oh, that’s near my house. I’d be happy to give you a ride there.” I figured out many months later that it was about 15 km away from his house, nowhere “near” by any stretch of the imagination. So upon landing we went through our separate immigration lines, I collected my backpack, and we met again outside customs where Tawn was waiting with almost all of his colleagues from the flight. He drove me to the hotel, made sure I was checked in properly, and then offered to collect me the next morning and show me around town. The next morning, I waited in the lobby as the appointed time came and went. Not surprised, I figured he had come to his senses and in the light of day had decided against the folly of hanging out with some strange passenger he had met. But about fifteen minutes after the prescribed time, Tawn pulled up in his grey Nissan, the same one we drive today. Over the next three days we visited many sights and had a good time hanging out. But on the fourth day he had to fly back to Hong Kong, overnight there, fly to Tokyo, overnight there, then come back through Hong Kong to Bangkok. Since I had more family passes to use, I agreed to fly with him to Hong Kong with the plan of waiting for him then flying back to Bangkok. On the flight from Bangkok, Tawn switched safety demo positions with a colleague so he wouldn’t have to look at me while doing the demo. Because of a broken seat, I was reassigned to a seat in his section of business class. He held the safety card in front of his face the whole time to avoid making eye contact. During the flight, the passenger seated next to me seemed confused about the highly attentive service I was receiving, the recommendations on what breakfast dish was best, the endless refills of my coffee, etc. In Hong Kong, we stayed on United’s bill at the Renaissance Harbour View in Wan Chai, and then when Tawn left for Tokyo I stayed with Stephanie. The following evening I went to the airport and waited for Tawn outside customs. He came walking out with the same group of colleagues as had been on the flight on which we met. Amidst the twittering and whispers between the other flight attendants, Tawn told me the sad news that he had been rescheduled and would have to fly back to Tokyo the following morning. No problem, I assured him, I would just use my passes to fly to Tokyo and then we’d head back to Bangkok together. Tawn asked the captain if I could ride the crew bus back to the hotel and the captain, with a look that said there’s nothing he hasn’t seen before, said okay. The following day Tawn went to the airport with his crew and I met him at the ticket counter later on with his purser, Jack – the one person who has known us since the day we met. Because of the heavy loads on the flight, the agent couldn’t give me a boarding pass yet, but I assured Tawn I’d see him onboard. He and Jack went to the flight and I stayed at the check-in counter, patiently waiting for my name to clear the list. Unfortunately, I couldn’t get on the flight. The Y2K fears had subsided and the flight was full. I even checked with Japan Airlines, All Nippon, and Cathay Pacific, but last minute flights to Tokyo were just too expensive. As Tawn relates the story, he kept scanning the manifest after the aircraft doors closed and walked up and down the aisles, searching for me. Surely I was somewhere on that plane. Sadly, I had not made it. While that could have been the end of the story, it wasn’t. I started my new job on January 17th, and am still employed with IKON as I work remotely from Thailand. Thankfully, with Tawn as a United employee, he was able to fly over and visit every four to six weeks. That gave our relationship an opportunity to take root and survive until the end of 2000, when Tawn moved to the United States to study for his Master’s degree. But it all started on that Hong Kong to Bangkok flight, January 3rd, 2000 – exactly eight years ago today. As a prologue, while I said that December 30th was my final day with AMC, I actually continued to work for them for two more years. The person who followed me as General Manager of the Kabuki 8 and Van Ness 14 in San Francisco recognized my value and convinced me to work part-time on weekends helping their cash handling and accounting operations. It wasn’t until February 2002 that I finally left AMC. This entry was posted in Personal and tagged anniversary, love, Moving, Moving to Bangkok, Relationships, Tawn by christao408. Bookmark the permalink. wow what a great story! congrats to the both of you .i actually work near that amc and have been there many many times. did you manage the amc empire 25? Aww… sweet story. Congrats to both you and Tawn. awww i love the story! Happy Anniversary, Chris. And thank you all for the comment. Hi, just cruising by. What a lovely story! Congratulations to you both 😀 And may I just say that I love how you have decorated your condo! awwwwwwww happy anniversary to you both!!!! i wish you a great 2008! awww, this is so sweeeeeeeeeeet! congratulations and happy happy anniversary to you both! I had heard the story but this was a great retelling. Thank you for adding a warm hug to my day. Happy anniversary to you both. What an interesting story. Thanks for sharing it. Continuous good luck to both of you. Isn’t is amazing how life tends to push you where you need to go? Happy Anniversary to both of you! Wow, how time flies! Is it already 8 years?? Come to think of it, it’s been 5 years since you celebrated in Manila after my wedding. I’m so happy for you both. Congratulations and see you next week! OMG that’s a very sweet sweet story….happy anniversary krub! Happy anniversary to you both, Chris and Tawn. Celebrate life. I must say “WOW!” for your amazing story and that’s how the fairy tale began. You two just too cute. WOW! This is so beautiful… just out of the pages of a book. Congrats. You said, “But it all started on that Hong Kong to Bangkok flight, January 3rd, 2000 – exactly eight years ago today”. As a permanent resident of Hong Kong, I am happy to know that Hong Kong played a role in this romance of yours. My y2k conversion was spent on a subway, somewhere in Queens. Thanks a lot girlfriend’s tour guide. @choyshinglin – And we actually made eye contact in the check-in line at HKIA so you can take special pride as a PR of HKG! =D@Konrado – Dangerous place. Ha ha ha! Amazing story, the type of experience many people long for. I’m glad it worked out for you. Oh wow, thanks for sharing your story. Happy belated anniversary…10 years, 1 month, and x number of days?? Man, I hope I have your courage and ability one day to leave something that no longer works and introduce myself to someone who could matter to me like that. @Roadlesstaken – Thanks Alex. I’m glad it has worked out, too. Maybe you should fly more. =D@LADYLILYTHAO – Thank you. I hope we all have the courage to seize opportunities as they present themselves. Sweetest meeting story I’ve heard in a while 🙂 I hope I have a story like this to tell at some laterpoint in my life. @Karenina_425 – I hope you have such a story, too. Thanks for commenting. @Sinful_Sundae – Thanks – I’ve been lucky that life has presented a number of those “need to make a decision” points and I’ve always felt I had enough support from friends and family that I could take the risks and live with the failure, if things did not work out well. That makes it much easier to make those decisions. Aw. I happened to click the link to this for the first time today. What a wonderful story! I, too, am part of an epic ‘how we got together’ story and am mixed when I tell it – 1/2 embarrassed by how terribly cute it is and 1/2 warm n fuzzy. @Vitamin_D – Glad you liked the story. It is one of my favorites, too. @moolgishin – Wow, two people read this old story and commented on the same day. Busy day back here in the archives! =D What is your warm-n-fuzzy story? Have you shared it on your blog? @moolgishin – Well, I look forward to reading it. Never heard this story… very sweet, I could “see” all of it. What a brilliant story! Haha. Beautiful. It’s really interesting how it all started with a few looks and how you guys had maintained interest at the early stages even whilst Tawn had to fly everywhere. Ahhh, beautiful. That’s really really cute.I was extremely sad when I hit the second to last paragraph (despite knowing the ending outcome)It’s like a short piece of a movie :]How did you guys know you guys were into each other?! @Devilzgaysianboi – That’s very cute that you were sad, despite knowing how the story ends. The story of how we met definitely has a storybook quality to it and one of these days, I’ll write the screenplay. Maybe. As for your question, how did we know we were into each other? At first, it was just exchanged glances – a very superficial level of interest driven by nothing other than hormones. But, then, that’s pretty much how any two people are attracted initially, right? As we spent time together and got to know each other, our interest grew. It took several visits by Tawn before we decided that our interest was serious enough for him to keep visiting and decide to move to SF. And it wasn’t until well after Tawn moved to SF that we really decided that we were committed to making a long-term go of it. your “benneton” video led me to this page. Every paragraph/episode makes me want to go to the next line, that’s rare for what I call “my senior’s short attention span”.